The Federal Communications Commission (FCC) is a government agency responsible for regulating the internet in the United States. Its members voted to end net neutrality by a vote of 3 to 2. Net neutrality is the idea that internet service providers should treat all traffic over the internet equally. In 2015, the FCC set the rule to prevent internet service providers from interfering with traffic from some websites while providing faster service to others. Under the new rules, internet providers will be free to block competing applications. Service providers would also be able to slow down competing services or offer faster speeds to companies that pay more. Companies will have to place their policies online or inform the FCC about them. The change also says states cannot approve their own rules for the internet that do not agree with FCC rules. Internet service providers like Comcast, Verizon and AT&T say that the internet experience is not going to change for most people. But many companies have worked hard to influence politicians to end the net neutrality rule. Some Americans worry that ending the rule means businesses will be able to control what they see and do online. 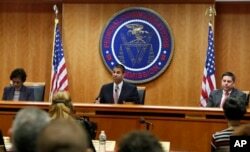 Before the commission’s vote, the FCC website recorded 22 million comments and members of Congress received more than one million phone calls. Hai Do wrote this story for Learning English based on AP and VOA news reports. Mario Ritter was the editor.